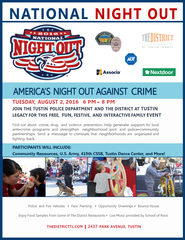 The Tustin Police Department will participate in the 33rd Annual National Night Out (ANNO). The event will take place this Tuesday, August 2, 2016 from 6:00 pm until 8:00 pm at The District, located at 2437 Park Ave., in the parking lot in front of the valet. You and your family are invited to attend National Night Out and help take a stand against crime. It is about crime prevention and interacting with law enforcement personnel in a more casual environment. National Night Out will be fun for the entire family. There will be entertainment, demonstrations, police and fire vehicles, community resource organizations, a kid’s area with a bounce house, face painting, and games.